Suede Cards reached the public the same time as Cotton Cards. Taste of Ink Studios began providing Suede Cards to the world in 2009. Since then, millions of fashionable Suede Cards have circulated the marketplace and are the face of many companies. Suede Cards have coined the term - fashionable business card. Why is this? Well, the synthetic suede stock provides a luxurious feel, soft matte finish, and is two times the thickness of an average business card. The printing process is such a delicate animal, that the design of Suede Cards is so important. Each card must be designed in a vector (design) based program - Adobe Illustrator. The card is manually printed on a letterpress and die must be created in order to print the pantone ink in the correct location on the Suede Cards. 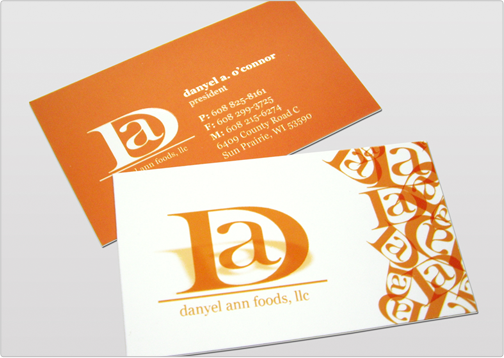 These specific business cards can be upgraded with decorative color foils, custom die cuts, rounded corners and metallic inks. There are twelve decorative foils that can be selected at Tasteofink.com. Each color selected will have its own die created. 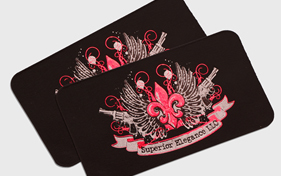 Many companies use foil stamping for their logo, content, patterns, or designs on their Suede Cards. The twelve decorative foils are: silver foil, gold foil, copper foil, light blue foil, dark blue foil, red foil, green foil, purple foil, pink foil, black foil, rainbow silver foil, and lastly rainbow gold foil. 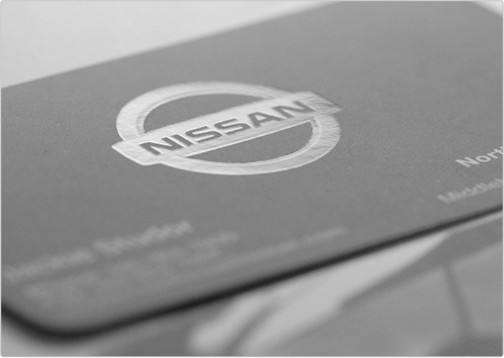 Companies from many different industries order suede business cards. Although the companies are from separate markets, each company is looking for the identical thing. They are wanting a professional business card that provides an esteemed image and class for themselves and their clients. Suede Cards are the top of the line and will impress practically any organization or business with its overall appearance and style. Suede Cards are not known for their affordability, but rather their beauty. There are multiple setups that take place for one suede business card print order. Each die has to be produced correctly and tested. Also, only one color or foil can be printed at time. The quantities range from 100 to 1000 on the website and in greater quantities as a custom quote. The larger the suede quantity, the better price you will receive. Why is this? Suede Cards are manually printed. However, once the press is setup and tested for accuracy and detail - the process flows quite quickly. Larger quantities will use up more stock, but the production time is practically the same as printing quantity 100.